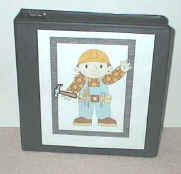 It's very easy to make your child a theme binder using a variety of methods. I find you end up with a higher quality binder that's less expensive than some of the fancy ones you can buy. good binder that has a clear plastic slip cover -- whatever color you prefer. These can be purchased at Wallmart or your local office supply store. Slip it in the front cover. Change it when you get bored -- or for different holidays, seasons, etc.